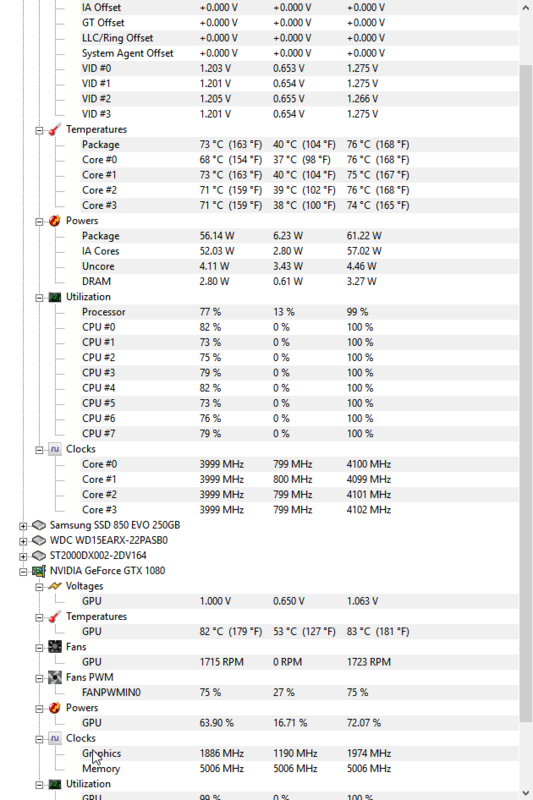 My pc supposed to be this HOT when playing Jurassic World Evolution? You'll need to tell us what CPU and what CPU cooler you are using, then we might be able to give you a good answer. What CPU do you have? Those temps are just fine for an Intel chip. Your CPU temps under load are just fine with that cooler and that CPU. okay thats a load off, but what about the GPU temps? GPU temps are on the high side but not scary. I would increase your fan curve to let it go up to 80-85% and see if that helps. I used to have to run my MSI Armor 980ti up to 95% to keep it cool. Well crap, it's possible that your fans are beginning to fail if they are no longer able to cool your GPU properly. Mine did that from running them at high speed and I had to hook up a 120mm AIO to my GPU to keep it cool. I'm sure there are aftermarket fan solutions if you wanted to stick with fans, which is probably cheaper. my GPU is not even 6 months old, from the start I was getting these temps. You think I should contact the manufacturer? You can give it a shot, not certain if they'll be willing to help, but it is possible. Good luck. What case are you using ? Both cpu & gpu temps would point me to substandard case airflow. Unless you're in a country that has very high (30c+) ambient temps at the moment? Also looking at that above , with an 8 threaded cpu you shouldn't be showing that kind of usage on all cores. What fan configuration are you running in it though ? The Phanteks P400 is a decent case and should have some decent airflow. How are you setting up the fan curve? Did you set it up through MSI afterburner or EVGA Precision X? What does the OSD say when the programs are running as it relates to fan speed? Zotac has a decent cooler on that GPU and it should not be 83C unless you have some really high ambient temps. And if that was the case your CPU temps would reflect it as well. But the cooler is working on the Zotac card or it would be throttling. I suggest going back and making sure your fan curve is working well. As stock settings and a 80% fan curve your GPU should hang out around 70-75C. I adjusted my fan curve using the Zotac firestorm software this is what it looks like. I don't think the fan curve is activated. On the first screen shot it shows 82C with 1715rpm fan speed. But the low temp of 50C has 0 fan speed. Your fan curve shows at 50C your should have 60% fan curve. I am not familiar with Zotac Firestorm and I am kinda stuck in my ways and use what I know. I suggest giving Afterburner or Precision X a try and use their fan curve. For stock settings an 80% fan curve should be more than enough. Question Would I be able to play and stream at the same time? Question Can my pc play Overwatch? Question Why does PC freeze with buzzing sound while playing 3D games? Question Why can't my mp3 file play anymore? f_panel cable supposed to be connected to the case. Is -5v supposed to be lit up on a psu tester? Question will my 500w psu able to run gtx 750ti? Question What should I upgrade next? Question Which is best option?